Spring is turning to summer, and in Okinawa, it is time to begin celebrations. Okinawans spare no effort in celebrating heritage and culture throughout the 5 summer and fall months. Eisa, the popular folk dances begun centuries ago to entertain the spirits of their ancestors, will play to townfolk and visitors alike in literally every city, town and village across the Ryukyu Kingdom. Eisa is bright, colorful and entertaining. From the drumbeats to the costumes, Eisa is the lifeblood of Okinawa tradition. It centers around Obon season, the Buddhist festival of the dead. It¹s the time when literally everyone on the islands turns attention back to home, and to the ancestors. Obon, known as Bon Matsuri, is celebrated August 17~19 in Okinawa, a month later than in mainland Japan. During this season, expect shops, stores and businesses to close as homage is paid to Okinawan ancestors. Literally, it is a time of celebration when everyone returns to his or her ancestral home districts, where visits with relatives and the graves of deceased relatives are common. It is Okinawan custom and belief that this pilgrimage be made each year during Obon. Off base and on, festivals are the essence of summer in Okinawa. From the smallest of villages to the festival with 10,000 Eisa dancers in Naha in August, there is ample opportunity for everyone to get caught up in the festivals of Okinawa. Kinserfest is the first of military bases to celebrate, and Fantastic Okiinawa will showcase the Camp Kinser festival next week. Dragon boat races are part of the summer fun. 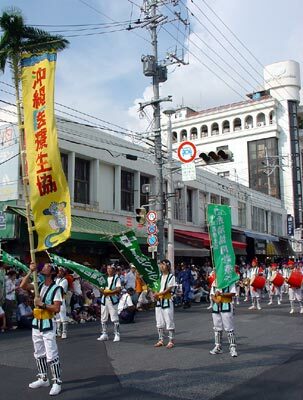 Naha¹s Matsuri took place in May, but Irabu in the south Yaeyama/Miyako Island district, has one this month. Itoman is also in the dragon boat race business this month. Tug of wars are popular too, with Naha¹s record ­setting rope pull and festival upcoming in October. Itoman also has a tug of war. Orion, Okinawa¹s locally owned brewery, traditionally hosts a few of its own. The first of the season is in Ishigaki later this month, where some 200,000 are expected to gather in the park for beer and entertainment. The Orion Miyako Festival is in July, while the brewery¹s hometown, Nago City, celebrates in late July and early August. Island Market will keep readers abreast of specific festivals throughout the summer and fall. Look for the Ocean Expo Park Festival, the Sanitsu Beach Carnival in Miyako, and the Urasoe Tedako Festival in July. 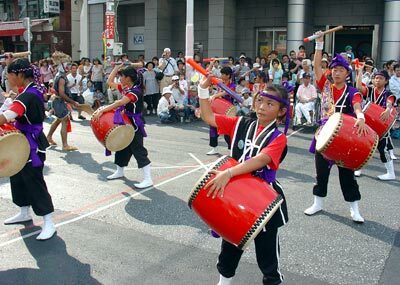 Eisa dance events are most popular in August, including the 10,000 Eisa Dance Parade and Youth Eisa Festival in Naha in August, along with the Yonabaru and Arigama Festivals. September sees the Okinawa Island-wide Eisa Festival, the Shioya Ungami Ritusal, Tarama Village Harvest Festival and the Itoman Tug of War. 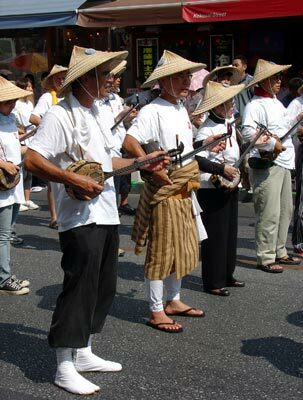 The Naha Matsuri is the mother of all festivals in October, with hundreds of thousands drawn to the Guiness Book of World Records setting tug of war. There¹s also the All Island Lion Dance Festival, the Futenmagu Shrine Festival and the Okinawa Industry Fair in October. Shuri Castle Festival is in November, along with Okinawa International Carnival, Suntopia Sports and Culture Festival, and the Tour de Okinawa, a cycling tour running across the northern part of the island. The Naha Marathon ushers in December. The Kingdom Festa in Ryuku follows, along with several pottery and products festivals and fairs. The Mabuni Fire and Bell Observance on New Year¹s Eve and New Year¹s Day cap the month. There are typically 2-3 festivals each weekend, affording terrific sightseeing and cultural opportunities across Okinawa. Each has entertainment, foods and carnival booths, and local Eisa performers.